Obedience competition is based on 200 points. Every team (handler and dog) enters the ring with 200 points. Points are deducted for less than perfect exercises by the handler and/or dog. To qualify and earn a green ribbon, the team must earn a total of 170 points and earn more than half of the points for each exercise. This is referred to as a leg. To earn a title the team must earn three legs under at least 2 different judges. Here is a general description of the exercises in the beginning classes. For precise information refer to the AKC Obedience Regulations. You can download Obedience Regulations from the AKC website or purchased from the AKC Online Store. You should always read the official rules for the obedience class you enter. The regular classes include Novice, Open and Utility. Each class offers A and B levels with different regulations for these levels in each class. These classes are progressive. You need a Novice title (Companion Dog- CD) to enter Open and you need an Open title (Companion Dog Excellent- CDX) to enter Utility for a Utility Dog – UD title. Novice A - This class is for a dog without an AKC CD title and a handler who owns the dog entered (or a member of the owner's household or immediate family) and who may not have previously handled any dog that has earned an AKC Novice, Open, or Utility title. 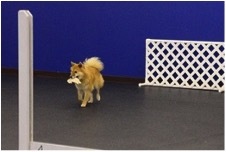 Novice B - Once you have placed a regular obedience title on a dog, you must enter all other dogs in this class. Heel on Lead & Figure 8 40 The pattern is usually an L with a slow, fast, 1 or 2 abouts, and 1 or 2 halts. The figure 8 is around 2 people. The lead is removed after the Figure 8. Stand for Examination 30 You are 6 ft away. The judge touches the dog then you return to the dog without him moving. Heel Free 40 The same heeling pattern is used off lead. Recall 30 You are across the ring. The dog must do a front and a finish. Novice A - For an owner who has not put an obedience title on any dog. Novice B - For an owner who has put an obedience title on a dog, not necessarily this dog. This owner must always enter the B class. Heel on Lead 40 Rally signs are used in the ring while heeling. Beginning with "Forward" and ending with "Exercise Finished". Rally signs are used to change direction of dog and handler and their pace from fast to normal to slow to normal along with halts. Figure 8 40 About turns with 1 or 2 halts, the figure 8 is done around 2 people. Sit for Examination 40 Sit your dog and go out to the end of the 6 ft leash and turn and face your dog. The judge will walk to the dog and touch his head. Judge will say return to your dog and you do just that and return to heel position. Sit Stay 40 In the middle of the ring you will be asked to sit your dog. With "Leave your dog," ask your dog to stay, drop the leash and walk the perimeter of the ring. 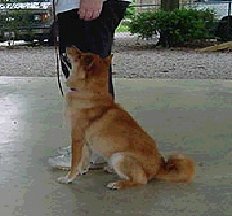 When returning to your dog, approach from the front and go into heel position, and the exercise is finished. Recall 40 Generally in the same area as your "sit/stay" exercise, you will sit your dog, and remove the leash. At the command "leave your dog," tell your dog to stay and walk away from your dog while holding your leash. You can put the leash in your pocket or around your neck. You will be about 25 feet away from the dog when you will turn and face the dog. At the judge's "Call your dog" you will call your dog to you and the dog should sit in front of you. There is no finish in this class. At "Exercised Finished" you put the leash back on the dog. There are no group sits and downs in the Preferred-Novice class. Heel on Lead and Figure 8 40 See Novice obedience for a description of this exercise. Stand for Examination 40 Same as regular Novice class. Heel Free 40 Same as regular Novice class. Recall 40 Same as regular Novice class. Stay - Sit or Down 40 The judge will decide whether all the dogs in this class will do a sit stay or a down stay. The dog and handler will be directed to the middle of the ring, the judge will say either "sit your dog" or "down your dog" and the handler will walk the perimeter of the ring. When the handler is in front of the dog, the handler walks towards the dog and returns to the dog in heel position. Titles are not earned for the non-regular classes. These classes are for fun or to provide a trial experience to help dogs prepare for regular or optional classes. The Wild Card classes are non-regular classes. The Novice exercises are performed as in the regular class except that verbal praise is encouraged and you choose one exercise that as the Wild Card. You don't lose any points for it even if you choose to not do it. It is a great way to introduce the Novice class at a real trial. 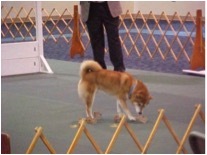 These are the optional and non-regular AKC obedience classes you may want try with your Shiba before entering the novice ring. In Beginner Novice and Preferred-Novice there are no group sit or down stays. So you have choices depending on which classes may work out best for you and your dog. Many clubs are offering these classes at their trials because they are popular with people who are just starting to show their dog and are a bit less formal than the regular obedience classes. Enjoy! Remember - Always read the official AKC rules for the class you enter! Confused about which AKC Obedience or Rally class to enter?